BG Meter Accuracy: 10 Popular Meters Put to the Test! BG Meter Accuracy: 10 Meters Put to the Test! These 10 meters varied in age and wear. Some were old, some were new... one was my own personal meter that I used to calibrate my CGM and make mission-critical decisions each day. All of them passed their respective control solution tests, so it's safe to assume that they were in good working order. I tried to match the testing method employed by Chris (author of the original post) as closely as possible. Order of meters was randomized for each round. Tests were performed only when CGM readings were stable (i.e. no insulin on board and CGM showing a slope of ~0 mg/dL/min). I didn't do anything special to stabilize my blood glucose -- just tested as I went about a normal day. The test strips used for each meter all came from their own unique vials. Before and after completing the eight testing rounds, the meters were checked using their respective control solutions. They all passed the control solution tests. Unlike Chris, I didn't have an alarming spread in my results for any round. 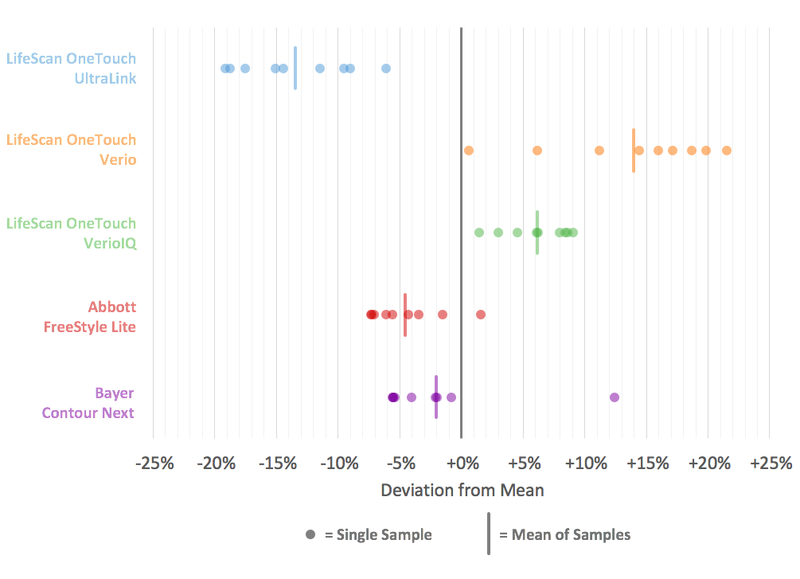 The overall between-meter variability ("% Error", or "%CV" for you stats folks) was only 6%. In plain English: My treatment decisions wouldn't have varied much at all, regardless of the meter I was using. One unit of rapid-acting insulin brings my BG down by ~80 mg/dL, and I correct whenever I'm over 100 mg/dL. I'll usually correct down to 70-110 mg/dL, depending on my plans for the next couple hours (big meal = correct to 70; workout = correct to 110). I was relieved to see that even if I took a correction bolus for the maximum BG of each round, I still would have been brought down to a desirable blood glucose level. For example, take Round 1. The highest reading I saw was 182 md/dL, and I'd take 1 unit for that. Even if we assume the true glucose was the lowest value from that round, 149 mg/dL, I'm still in good shape taking 1 unit because I'd only go down to ~70 mg/dL. What does this mean for A1C? To figure out what this means for A1C estimates, let's take a look at how each meter's average value over the 24 hours of testing compares with the overall average across all meters. (NOTE: I realize that the average across all meters may not accurately represent true A1C, but this comparison is useful to show that, no matter what meter you use, you're getting roughly the same results for averages and, thus, roughly the same estimated A1C.) Looking below at the deviation from the mean -- i.e, how much each meter's average value (solid gray line) differed from the overall average value (dotted gray line down the center) -- I like what I see! 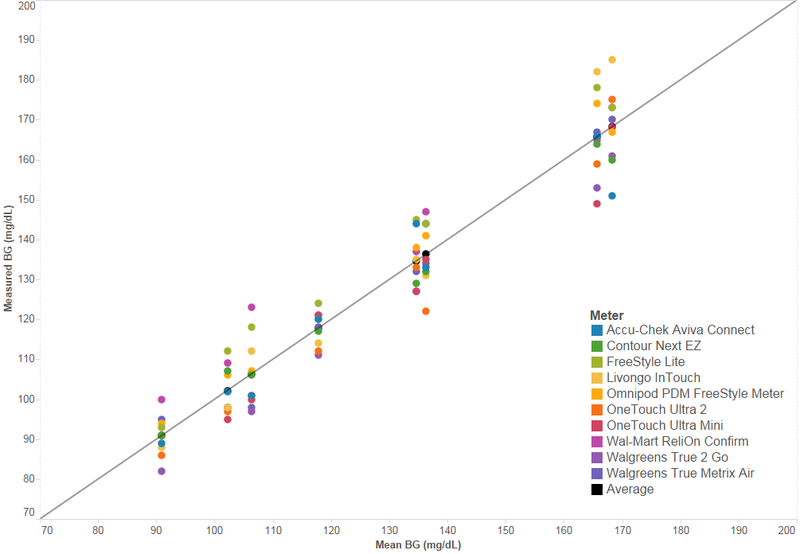 The average BG for each meter (solid gray line) was pretty close to the overall average (dotted line down the center), with the greatest deviation at around 6% (FreeStyle Lite & Walgreens True 2 Go). (Compare Chris' results, where max deviation was 14%.) This means an estimated A1C calculated based on the average value from any of these meters would be roughly the same. For example: If your average blood glucose on your meter were 154 mg/dL, that would translate to an estimated A1C of 7.0%. I think most of us would agree that this is an acceptable degree of variation between estimated and actual A1Cs. * Important note: This is just based on the data I collected for the specific meters I had in my possession. I can't say whether these trends would be true for all meters of any particular brand that I tested. READ: Why doesn't my average BG match my A1C?! What about the post that started all this? Why were those results so off? GM Consensus Statement, Endocr Pract. 2016;22(No. 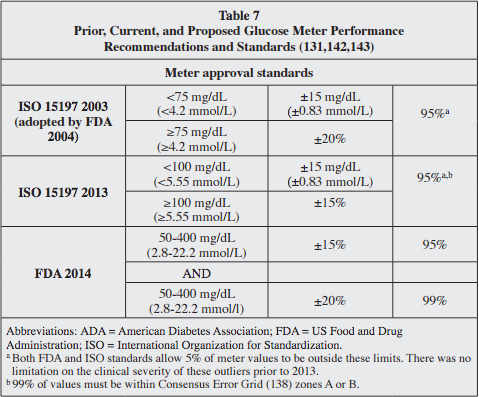 2)[/caption] The FDA requires that all new meters meet particular standards (shown here in Table 7), but once a meter is approved, the FDA does nothing to monitor accuracy. This is significant because, although the meters may have functioned perfectly when approved by the FDA, that was with a particular set of test strips. Test strips can vary from batch to batch. Test strips contain an enzyme that converts glucose into an electrical current that runs through the test strip and is read and displayed on your meter as a glucose concentration. Enzymes are proteins and can breakdown due to humidity, temperature, and many other factors. 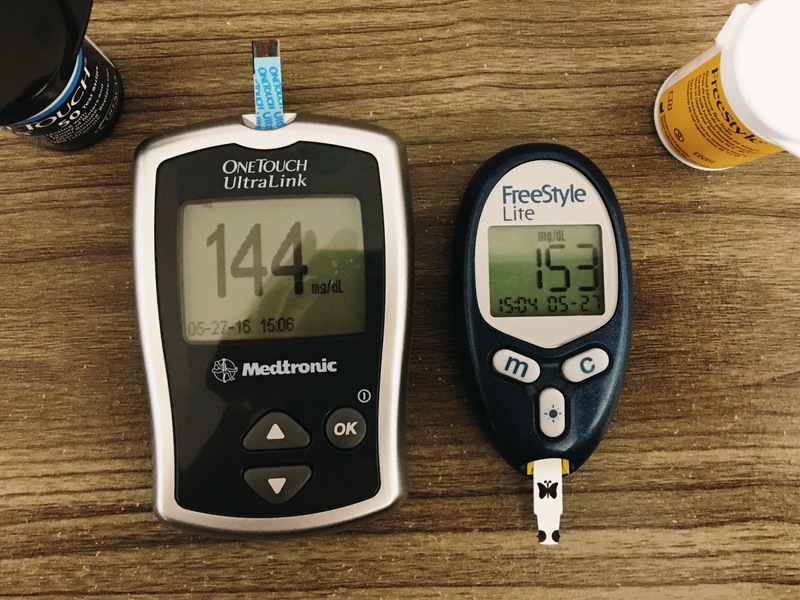 So, differences in the environment in which the test strips are manufactured, stored, and used can lead to differences in the blood glucose measurements they provide. Those differences may be OK -- the blood glucose values provided by these strips may still fall within the FDA's standards -- but, when we are comparing one batch of strips to another, things can get hairy... For example, suppose one batch of test strips yields BG readings that are 10% too high, and another batch (for a different meter, by a different manufacturer, or even for the same meter by the same manufacturer) yields readings are 10% too low. Even though each of these batches of strips might have an acceptable difference from the true BG value, there is a 20% discrepancy (bias) between them. The differences could be clinically significant, especially when combined with a 7% random error on top of the 10% systemic bias. More testing should be done! I feel pretty good about meter accuracy based on my own experiment and personal experience, but I'd feel even better if more people conducted similar experiments and got similar results. Results like Chris' are scary -- they make us feel like no matter how hard we try we may still be missing the mark. And the consequences go beyond the emotional toll -- meter and test strip inaccuracy may lead to results that fool us into thinking everything is A-OK, when it's really not. Bottom line: we need to be able to trust the devices we use to make critical decisions about our health every day. If meter accuracy really is an issue, it needs to be addressed right away.